If you find yourself travelling a lot for work, you probably do a lot of emailing while you’re on the road. To ensure that all of your data remains private, you need a secure, portable, and mobile email client that will continue to keep all of your information safe regardless of where your work happens to take you - The Bat! Voyager does exactly that. The Bat! Voyager keeps your message base and address book password protected, meaning that even if you happen to misplace your USB drive, you can rest easy knowing that no one can gain access to the information that’s saved on it. Worried about your information being lost with the USB stick? Don’t be! All of your data will be on a backup file on your computer – Simply restore your data to a new flash drive and you’ll be good to go again! - Gives you the opportunity to compose and send emails from anywhere in the world that you can establish an internet connection. - Keeps your address book handy for quick message sending. 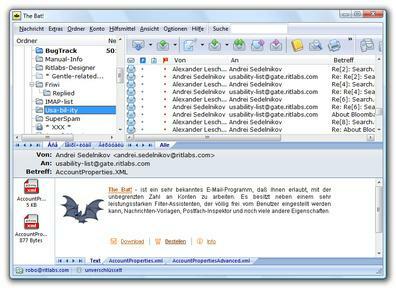 - Allows you to reach your mail archive any time you’d like quickly and easily. - Preserves your email templates and extensions for you to make your job easier. - Protects everything on the drive with powerful encryption. - Safeguards your mail from viruses and other malicious software. - Allows you to pack lighter (no laptop) and safer than you ever have before! - Absolutely perfect for any travelling business person. Please note that in order to be able to use Voyager it is necessary to possess a licence for The Bat! Professional Edition. The order number and registration key for The Bat! Professional are also valid for Voyager.